In the South there’s a lengthening warm light that skews and melds boundaries. It’s a louche light, surprisingly slippery in feel and flavor. And it’s for this reason that one has to imbue one’s boundaries with intention. Cezanne knew this instinctively and created a world where outlines defined structure while receding slowly into process. It’s a vision imbued with a nostalgic classicism. Cy Twombly, also a Southerner, understood this kind of vision, and I thought it would be interesting to look at the way this innate understanding of light influenced his life. In 1966 Horst took a series of photographs of the Twomblys’ life in Rome. There’s no doubt that these pictures were theatrically posed, a heightened reality, but all the “props” are there. The “ruined” villa spaces, the geometrically tiled floors, and the white stuccoed rooms bouncing the light through the spaces. These things create an atmosphere of relaxed elegance, a slow space for temporal vision. 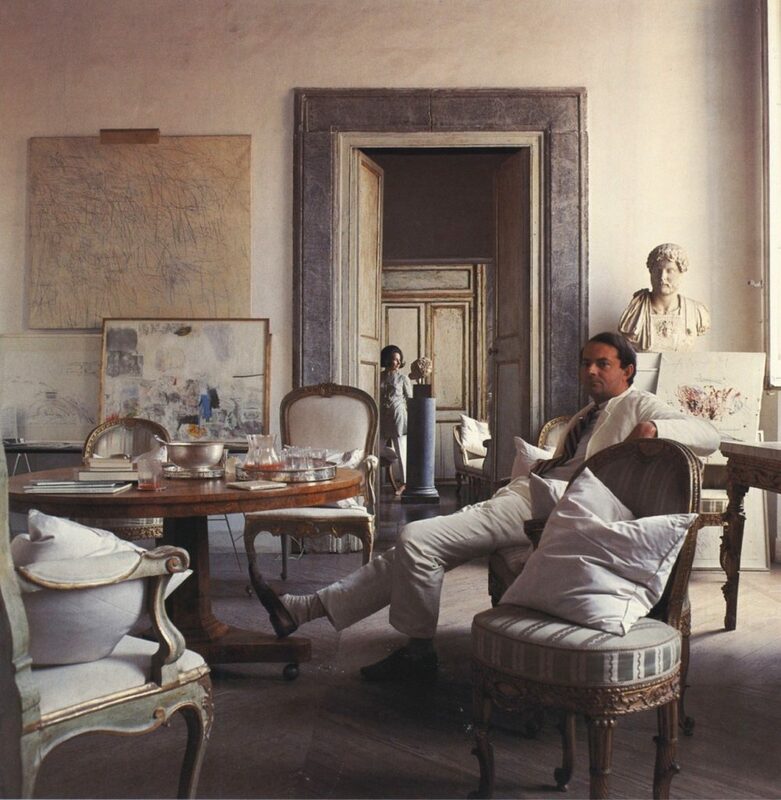 Twombly himself looks the part of the expat Southern gent combining the storied ancient history of Rome, a disreputable abstract classicism and the insouciance of the Virginia gentry. And apparently this portrayal of Twombly ruined his career for a time. Like Twombly’s paintings there’s a nostalgia for an appropriated history in this house. The French Louis furniture, the ornate tapestries, the Roman busts and the physical graffiti all exist in the same unpredictable space, resting on the floor, leaned against the wall, and creating an elongation, a flux in this moment of time. It’s a history both lived and imagined. In Rome you can find this antique “style” nearly everywhere, but here there’s a specific purpose behind these objects. You have to remember that Twombly and Rauschenberg had traipsed all over the Mediterranean in the early 1950s, living through histories and cultures that most Americans hadn’t even imagined. Cy’s remaking himself through the Mediterranean light, through his southern upbringing, drawing fluid edges around himself and Rome to find a different sort of expressionist imagery in painting and in life. 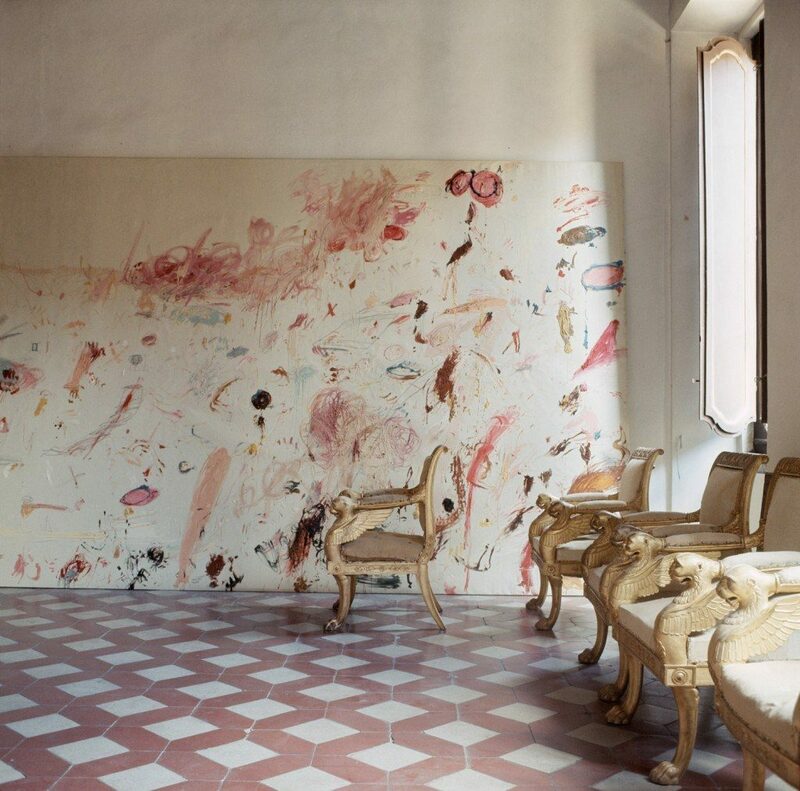 Twombly was extending his idea of history painting into these rooms and creating a Modernism imbued with Classical history. 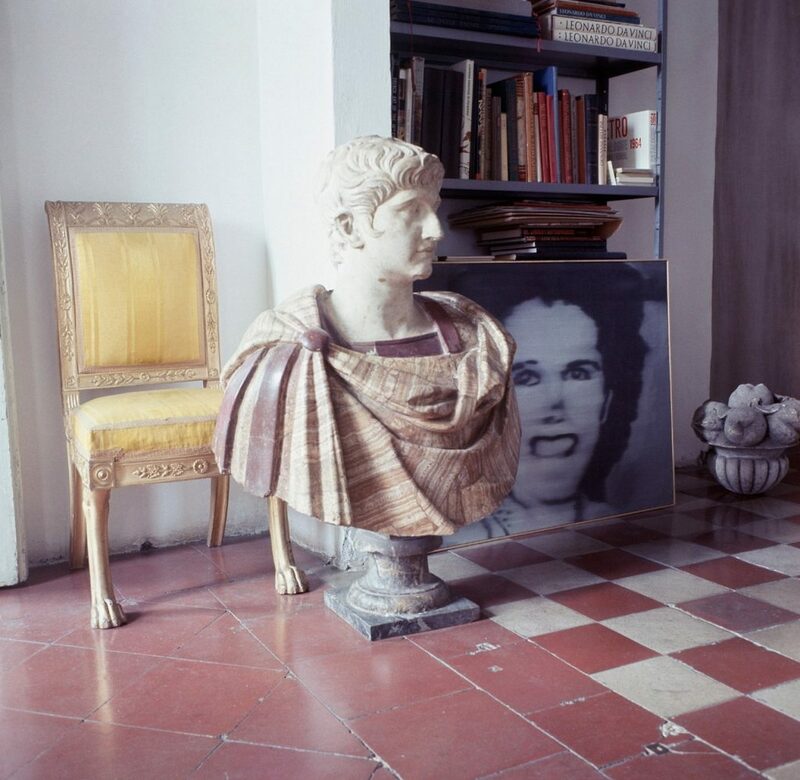 Another surprise is in this photo – the Roman bust flanking the Richter portrait [Frau Marlow 1964 – what American had a clue about Richter in 1966?] and the ease with which these things exist together. Twombly’s eclectic use of imagery from different eras may well be the expat’s understanding and exploration of the 1920s and 30s’ “return to order” which was a search for a deeper mythology within the Modern era. In the purity obsessed US the muddying of classical history and Modernism was considered retrograde, nostalgic, suspiciously campy and based on a decadent and dangerous view of history. Greenberg didn’t much like the lost generation’s idea of European Modernism and Donald Judd [for a fun comparison have a look at Donald’s way of life and sensibilities] had a few choice words to say about Twombly’s Castelli exhibition from 1964 calling it a “fiasco”. It turns out that these evangelical progressives had no idea what was at work here and how this sort of Southern vision, space and light might capture and shape one’s imagination.